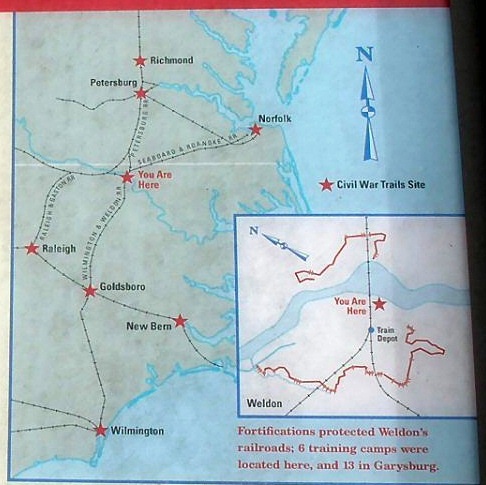 The fall of Wilmington, denying access to the Wilmington and Weldon Railroad, was a major factor leading up to Lee’s surrender at Appomattox. 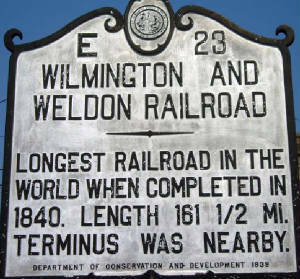 "Longest railroad in the world when completed in 1840. Length 161 1/2 miles"
"The most critical railroad in the United States"
References: Cecil K. Brown, A State Movement in Railroad Development (1928); Allen W. Trelease, The North Carolina Railroad, 1849-1871, and the Modernization of North Carolina (1991); W. C. Allen., History of Halifax County (1918); Charles Clinton Weaver, Internal Improvements in North Carolina Previous to 1860 (1903); William S. Powell, ed., Encyclopedia of North Carolina (2006).